Paxos, so legend tells, was the love nest of Poseidon and the nymph Amphitrite. Wanting a secluded place to meet Poseidon broke a piece from Corfu with his trident and cast it far out to sea…. When I was younger I felt I knew Greek well – ‘well, most of it is the same isn’t it?’ I would confidently proclaim as we went from family holiday to family holiday in similar surroundings. As I’ve become older I’ve realised I could not be further from the truth. I am yet to get tired of endlessly atmospheric landscapes, blissfully stunning beaches and quiet coves in which you can lose the best part of your day as far away from the modern world as possible. Paxos is one of those islands which really is a world apart and a perfect escape for travellers looking for a stress free break. After a mercifully brief experience in Corfu airport I was whisked to Sunvil’s chartered boat and enjoyed a two hour journey onward to Paxos watching the scenery disappear over the horizon behind me. This was the first sense of going somewhere miles away from conventional Greece; and as the main port of Gaios loomed into view, Corfu was nowhere to be seen. The hub of this small island seemed to have little in the way of a corporate holiday atmosphere – a small Hyundai hire car was waiting for me and and with bags and case stowed I was on my way to Livadi Apartments, my retreat for the next 7 days. The little town of Lakka on the very north of the island lies in a pretty, sheltered cove which seems to hold a yacht party every day of the week. Not that this proved inconvenient, the ‘boating’ crowd seem to share a significant portion of the island’s wealth which means trendy bars and a decent amount of choices when it comes to food and drink. Lakka’s appeal wouldn’t be complete without the close proximity of two attractive and accessible pebble beaches. The snorkeling opportunities and the brilliant swimming ensure the day is easily whiled away – it’s addictive just watching the well-heeled jump from their yachts and repeat ad infinitum. 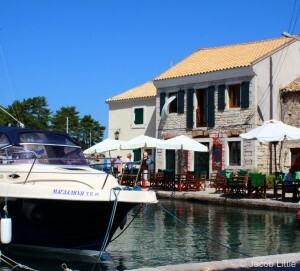 Nightlife in Lakka is occasionally sedate for a younger audience; however expect to find a party or two in Romantica and Akis well into the night during peak season. Underwater lighting and the gentle bobbing of fishing boats in the immediate harbour add a feeling of being ‘away from it all’ and to the impression of relative exclusiveness. Out of town, the roads around Paxos are extremely well maintained and connect a network of paths and routes to secluded beaches and coves. The impressive Ben’s Bar at Monodendri beach has a car park and is a great place to sip a beer or two and lie on a lounger in relative peacefulness. Free water sports facilities such as kayaks add a sweetener to the deal, too. On the subject of waterborne transport, consider hiring a boat (Paxos Boat Hire, Lakka or Loggos, from €30) to really make the most out of the east and west coasts. The calm east coast, with mainland Greece bearing down, is a fantastic place to anchor up in small inlets and snorkel, dive or sun worship with the ability of having a freedom of choice no other form of transport gives. It’s a magical way of getting to know the island and the difference between various beaches and ports. The only advice I learnt from this would not to be too picky and leave the guidebook at home – just take a map so you know how to get back and follow your nose. My second week in Paxos was booked in a town slightly further south and with a different atmosphere altogether. Loggos, the rustic, shabby-chic ‘tourist’ capital of the island has its fair share of what one can experience in Lakka, with the added charm of a working fishing harbour and smaller tavernas which draw international attention for the quality of their food. Staying in the Marmaris Beach Cottages, the real draw here was the proximity of the stunning beach of the same name. It wasn’t long after dumping my bags I headed for a swim and I immediately felt at home – the accommodation was basic but adequate with a number of delightful features such as a large outdoor table and a BBQ for relaxing summer evenings on the spacious terrace. This was a far cry from ‘mainstream’ islands such nearby Corfu and Kefalonia. My week in Loggos disappeared as the days were expelled relaxing on the beach while the evenings were taken up by gorging on sumptuous seafood and retaining a healthy appetite for local beer. Before I knew it 14 nights were up, and Sunvil’s boat was ploughing its way through the crystal seas back to Corfu and eventually the airport with me on-board. Paxos certainly isn’t the most active, action-packed place I’ve ever been and it certainly isn’t the Greek island with the most facilities. It did however stun me with its beauty and the charm of its landscape, and it took me by surprise with the way in which it embraced an old-fashioned Greek way of life which is quickly becoming ignored in modern day culture. 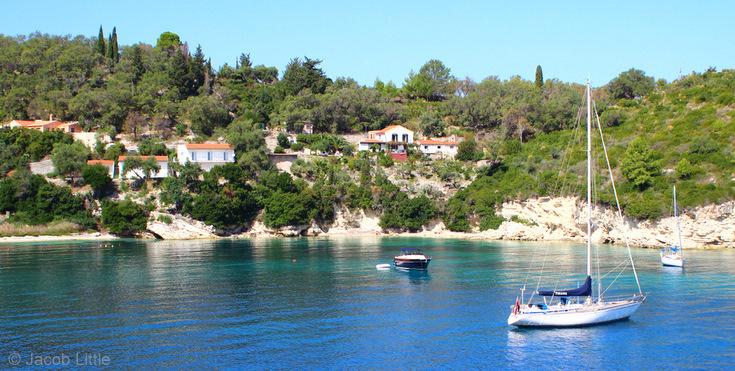 For these reasons I would specifically choose Paxos as a destination as opposed to the more obvious Ionian islands such as Cephalonia, Zakynthos or Corfu. The natural beauty on offer is compelling and the range of accommodation may well mean you have your very own beachfront apartment. Without the crowds or excessive tourism this does seem a very attractive proposition indeed. There is a bus service which runs daily between Lakka and the main town of Gaios. Ask in advance but buy your tickets on-board. Hiring a car or bike is recommended and a boat is even better.